The LILAC conference web site defines information literacy as “the ability to find, use, evaluate and communicate information” and goes on to describe how information literacy is “an essential skill in this digital age and era of life-long learning”. Yet information literacy appears to be regarded as a skill which students need to be taught, with little consideration being given to the needs of staff and researchers to be able to find, use, evaluate and communicate information once they have left their host institution. If information literacy is to be treated as “an essential skill in this digital age and era of life-long learning” there is a need to ensure that training and support is provided to staff and researchers, especially when they are in the process of leaving their host institution and may need to migrate content and communities before they lose access to their institutional IT environment. 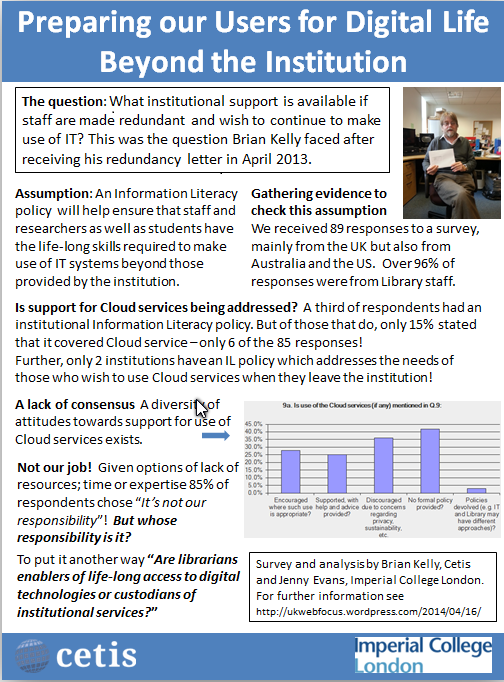 This poster provides the findings of a survey which sought to identify current institutional activities and plans to prepare staff and researchers for professional life when they no longer have access to institutional services and will need to make use of Cloud services. The LILAC conference web site defines information literacy as “the ability to find, use, evaluate and communicate information” and goes on to describe how information literacy is “an essential skill in this digital age and era of life-long learning“. In this symposium Brian Kelly will provide personal experiences of the approaches he used to prepare for professional life beyond his host institution where he worked for over 16 years, prior to Jisc cessation of UKOLN’s core funding which led to redundancy for Brian and many of his colleagues. Jenny Evans will report on the findings of a survey of institutional policies on training and support for staff and researchers who are leaving their host institution and how her host institution, Imperial College London, as well as other institutions could potentially ensure that staff and researchers are well-placed to make use of Cloud services if they wish to continue their professional careers. Following presentations which will provide the context for this work, Brian Kelly and Jenny Evans will facilitate an open discussion which will address the requirements of enhanced provision of information literacy skills and consider institutional barriers to implementation. The symposium will conclude by seeking to agree plans for further work which can help to ensure than a strategic national approach is provided to information literacy support for staff and researchers so that they are well-positioned to continue professional activities after they have left their institution. Further information: See the abstract on the LILAC 2014 web site. Type of proposal (accepted): The proposal was accepted as a poster display. The display of accepted posters took place from 11.00-11.45 on Thursday 24 April 2014. Poster: The poster is available on the Slideshare Web site. Brian Kelly worked at UKOLN, University of Bath for over 16 years. He had to address the challenges of migrating his professional digital environment to the Cloud following the Jisc cessation of UKOLN’s core funding in July 2013. Since October 2013 Brian has been employed as the Innovation Advocate at Cetis, University of Bolton. Jenny Evans is the Maths and Physics Librarian at Imperial College London Library. She has led staff development initiatives to raise awareness of social media and its use in the workplace, establishing the ‘Learning 2.0’ programmes at Imperial starting in 2008 and the ‘Research 2.0’ programme at Imperial starting in 2011 and has written papers on and presented at a number of events about these initiatives. Jenny continues to work with library and academic colleagues across Imperial to develop new ways to support researchers and students.